The Korean market for big SUVs is heating up now that carmakers are keen to capitalize on growing demand for spacious cars. So far the market had been dominated by a handful of Korean cars like the Ssangyong G4 Rexton and Kia Mohave and the imported Ford Explorer. But now the Hyundai Palisade has been added to the mix, and Hyundai affiliate Kia will bring in the Telluride, which hit U.S. showrooms early this year. GM also plans to sell the Traverse here. Big SUVs have become sizzling hot among customers who want to impress thanks to low gasoline prices. Their off-road capabilities and huge passenger space are adding to the appeal. 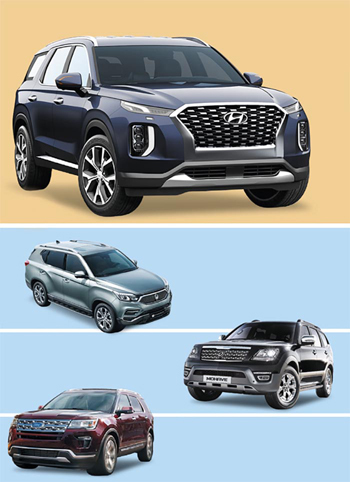 Hyundai rolled out the Palisade last December with a price tag in the low W40 million range, packed with high-tech features and a 5-m frame that takes up all the road space there is (US$1=W1,138). Until the end of last month it sold 55,000 units, but only 20,000 were delivered, prompting the carmaker to increase production. That already surpasses last year's sales of 16,674 G4 Rextons, which had led the market. In the first three months of this year, the Rexton's sales plunged 25 percent on-year to 4,019. A Ssangyong staffer tried to put a brave face on it. "It's true that competition is heating up, but it's good to see the large SUV market growing," he said. Ford seems to be taking a hit, too. The U.S. carmaker relies on the Explorer for 60 percent of its total sales in Korea with 11,586 units sold last year. But it guzzles even more fuel than the Palisade and is over W10 million more expensive. In February, sales fell from 400 to 500 a month to just 307. And more are ready to ride the boom. The GM Traverse will be the biggest SUV sold in Korea, and the price tag of around W35 million is sure to boost its appeal. Kia will roll out a facelifted Mohave in the second half of this year and already unveiled a concept version at the recent Seoul Motor Show. Mercedes-Benz plans to launch a fully overhauled GLE here, while BMW has already launched the revamped X5 early this year and will roll out the X7 by June. It has already started taking pre-orders. 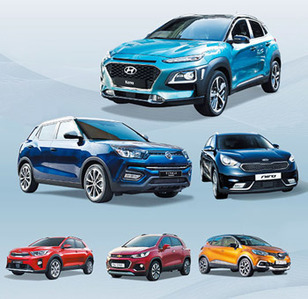 Lee Hang-koo at the Korea Institute for Industrial Economics and Trade said, "Hyundai's aggressive marketing is fueling the growth of the large SUV market here, but oil prices are climbing again, so there's a risk that the boom won't last."